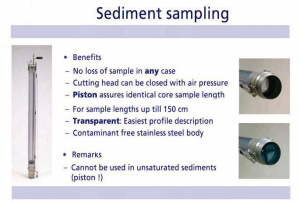 Our Sediment Sampler is ideal for very soft saturated samples and environmental sampling, e.g. river beds. It has been used to take samples on a tailings dam at depths of more than 70m, where the qt values were between 0.2 - 1.0MPa. Sample recovery was 100% due to the sampler's use of a bladder to seal the sample tube before recovery.